Welcome to our Nebraska State Facts section, part of an educational project designed to provide information about indigenous people in different U.S. states. Follow the links to the right of our tribal map for more information about the language, culture and history of each Nebraska tribe, or scroll below the map for Nebraska Indian activities including a wordsearch, fact sheets, and words from the Native American languages of Nebraska. Feel free to print any of these materials out for classroom use! Did you know the name "Nebraska" is a Siouan Indian word? It comes from the native name for Platte River, which is Nibthaska (in Omaha-Ponca) or Nibrathka (in Otoe). These words mean "flat river." The Omahas, Poncas and Otoes are not the only native people of this region, however. There are four federally recognized Indian tribes in Nebraska today. Nebraska Tribes Word Search: Printable puzzle hiding the names of Nebraska's Indian tribes. Nebraska Language Greetings: Learn to say "hello" in several Native Nebraska languages. Nebraska Native Animals: Learn the Native American names of Nebraska animals. Nebraska Indian Facts for Kids: Answers to frequently asked questions about the tribes of Nebraska. 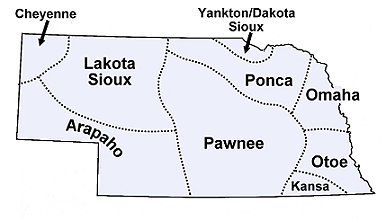 Ponca, Sac and Fox, and Winnebago tribes. An Unspeakable Sadness: Dispossession of the Nebraska Indians: Excellent history book on Nebraska Indian history in general. Nebraska Indian Dictionary: Introducing Nebraska's Native American history and culture to kids. Encyclopedia of Nebraska Indians: Thorough reference book about the Native American tribes of Nebraska. Mari Sandoz's Native Nebraska: Images and descriptions of Native American life in Nebraska, particularly the Cheyenne and Sioux. The Nebraska Indian Wars Reader: Essays on the military history of Nebraska's Indian tribes, especially the Sioux and Pawnee. Standing Bear and the Ponca Chiefs: Narrative history of the Ponca tribe. Susan La Flesche Picotte, MD: Biography of the dynamic Omaha leader and reformer. Uses of Plants by the Indians of the Missouri River Region Handbook of herbs, food crops, and plant lore among the prairie tribes. 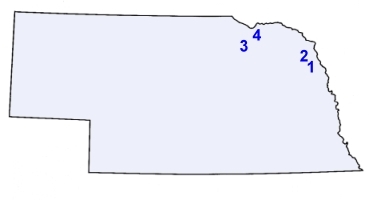 Nebraska intertribal school with campuses in Macy, Niobrara and South Sioux City. Government site on the Native American tribes of Nebraska. Map and profiles of the Nebraska Indian tribes. Would you like to sponsor our nonprofit work on Nebraska languages?